Here is a shot of my desk at work. Does it look like I'm busy? 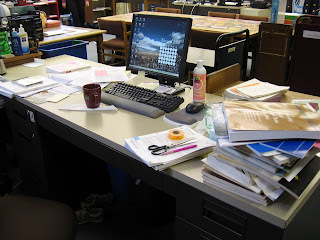 Library work used to be such that you always had a lot to do. Now with most things being done electronically there is less and less to do. So, I've developed the art of "looking" like I have a fair amount to do. That stack of books on the right, I can't even remember what I was doing with them. Now they say, "Whoa, she has real work to get done!"